I'll be spending a lot of time here, talking about UMSL's journal, its program as well as Architrave. I'll have poems available for sale, as well. I'd love to meet you, so stop on by and introduce yourself! It’s my hope that as readers stay with Architrave, their poetic sensibilities will sharpen and they’ll be game for more challenging reads. This is just such a poem. It will resist its reader for a time, but ultimately rewards patient re-reading. This process is one of the things I love about reading poetry: how the nuances of the poem’s idea materialize out of repeated readings. The first time through The Lifeguard, there are only the barest contours of a story: a child has drowned and the lifeguard on duty has slunk away to nurse the shame of his failure. What is meant by all the other language, all the images, exists as a fog. Slowly, then, maybe after five or six reads, the fanciful elements begin to separate themselves from the actual. I love how the mundane (boats, children, fish, lakes) is combined with the sublime ("sole upon silver," "my steep body flashed," "the ghost of a snowfield in summer"). The former provides a firm place to stand, something for the reader to grasp while the poem takes off into the latter. I have never been a lifeguard, but I can identify with what he’s going through. I have certainly failed in spectacular, public fashion. And even though no one died, I still relived these failures privately, entering the realm of magical thinking where I can say or un-say, do or undo the essential thing, to will myself from failure into success. Just like in the world, the poem's language of magical thinking intersects seamlessly with the language of the everyday: "I wash the black mud from my hands" sits right next to "On a light given off by the grave/ I kneel in the quick of the moon." Just as in life, the border is present, but porous. And therein lies this poem's greatness: its verisimilitude includes the surreal leaps a human mind can make in the face of failure. Like the lifeguard, I am always left with arms full of only water (or air, or a pillow as the case may be). This poem breaks my heart every time I read it. Mostly, though, I'm comforted to know I'm not alone in my magical leaps, which is why, twenty years after I first encountered it, I continue to read it. A Book About Divorce & Death You'll Want To Read More Than Once?! Really?! Really. 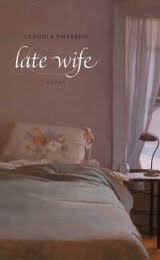 Rereading Claudia Emerson’s Late Wife, I was struck by how warmly it welcomes its readers. Emerson’s “I” maintains a consistent identity, so much so that the book gains a narrator. That’s an unusual element for a poetry collection; in this case it offers the habitual reader of fiction or memoir something familiar, even as the book remains within the boundaries of poetry. There are metrical and formal virtuosities to spare, should a reader wish to look for them, but what inspires that second look is how the single lens of the “I” threads the poems together.